The Learjet 35A, also known as the Bombardier Learjet 35A, is a light twin-engine corporate jet aircraft, developed by Gates Learjet Corporation, today Bombardier Aerospace of Canada. Introduced in 1976, the Learjet 35A is an improved development of the Learjet 35, with upgraded Honeywell Garrett TFE731-2-2B engines, plus Century III wing and a maximum take-off weight of 18,300 lbs. 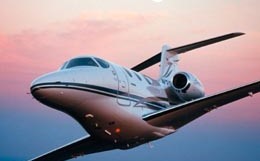 The Learjet is capable of carrying up to 8 passengers, with one passenger traveling in the jump-seat. The Learjet 35A aircraft has a cabin volume of 268 cubic feet, thus making it one of the smallest among legacy light jets. The Learjet 35A has higher standard max takeoff weights over its predecessors, and stands out by its reliability, capability, and value. A derivative of the original Lear 23, the Learjet 35A welcomed in a new generation to the Learjet line. 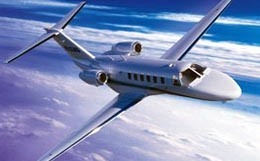 Previously, these private business jets had been powered by turbojet engines. However, with the introduction of the Learjet 35A model, turbofan engines made their debut in the line, adding both fuel efficiency and a quieter cabin for increased passenger comfort. Both the Learjet 35A and Learjet 36 models were granted Federal Aviation Administration (FAA) certification in July of 1974. The Learjet 35A retains many similarities to its predecessor, the Learjet 25, but features a stretched fuselage to account for the upgraded engines. 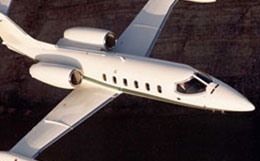 Production on the Learjet 35A started in 1976 and ended in 1993. 610 aircraft have been built so far. 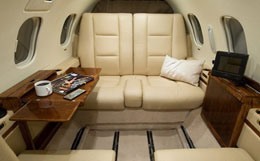 The cabin of the Learjet 35A is typically configured to accommodate between seven and ten passengers, with optimization at eight passengers, and requires two crew members. The cabin of the Learjet 35A utilizes the same fuselage cross section to that of the Learjet 25. As such, the cabin of the Learjet 35A measures 12.9 feet in length, reaches 4.3 feet in height, and stretches a maximum of 4.9 feet in width with a floor width of 3.0 feet. This private business jet features approximately 40 cubic feet of baggage storage located behind the aft fold down divan seat, which is accessible in flight. With a maximum cabin pressure differential of 9.4 psi, the Learjet 35A is capable of maintaining a sea level cabin altitude at an altitude of 25,700 feet. The Learjet 35A comes equipped with two Garrett AiResearch TFE731 turbofan engines. Each engine is rated at 3,500 pounds of thrust at take off. The Learjet 35A requires just 4,972 feet of runway to take off at sea level on a standard day. At an airport with an elevation of 5,000 feet, this take off requirement increases to 10,100 feet. With four passengers on board, the Learjet 35A needs just 2,550 feet of runway to land. This private business jet features a maximum certified service ceiling of 45,000 feet and a maximum range of 1,924 nautical miles. For a flight to a further destination, the Learjet 35A is capable of maintaining an airspeed of 424 knots at an altitude of 43,000 feet in a long range cruise configuration. 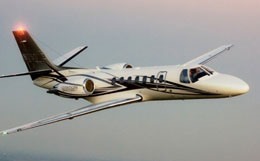 For a swifter flight, this private business jet is capable of maintaining an airspeed of 451 knots at an altitude of 41,000 feet in a high speed cruise configuration. The original Learjet 35A instrumentation system featured analog displays and instruments. However, as technology has advanced, digital flight deck options have become available as an upgrade. Typically, the Learjet 35A is fitted with a Collins avionics system, which includes Collins navigation, communication, and ident radios along with optional equipment such as a Collins electronic flight information system (EFIS) package with right side and left side primary flight displays (PFDs) in conjunction with a large center multi function display (MFD) along with a colour weather radar and a flight management system (FMS). For more information about chartering, leasing or buying a Learjet 35A please contact us by calling +44-20-3874-8091 or send us an email here.